Bradford City Football Club0871 978 1911work FootballBradford City was founded in 1903, and won the FA Cup just 8 years later! They enjoyed two seasons in the Premiership at the turn of the millennium. Bradford City Home kit is the distinctive claret and amber jerseys. Bradford City are nicknamed The Bantams. The club's Coral Windows Stadium, still known to many fans as the traditional 'Valley Parade', holds over 25,000 and has been completely redeveloped in recent times with some truely impressive stands. The stadium has a place in football history, having witnessed the best and the worst of times, from promotion celebrations to the tragic events of the Bradford fire in 1985, which have been woven into the legend and the psyche of the club, and all who follow it. 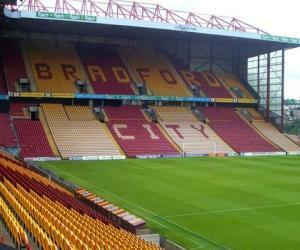 Bradford City was founded in 1903, and won the FA Cup just 8 years later! They enjoyed two seasons in the Premiership at the turn of the millennium.